"I know that people who don�t throw the Shot Put don�t think it would make a big difference,� Nelson said. �But for me, it helps me line things up in the back of the circle." Today: Birmingham: World Record Attempts at 2 Miles by Defar and Bekele, Fabulous Men's 1500 It's one of the top indoor meets in the world and has loaded fields. World "best" attempts at 2 miles by Bekele and Defar with (Kara Goucher in the field, plus a loaded men's 1500. Bernard Lagat will have his hands full with Dan Komen who ran 3:34.80 on Wednesday and World Champs bronze medallist Shadrack Korir. *Meet Promoters Hoping To Break Attendance Record Tickets are still on sale. The meet will be broadcast on ESPN on Sunday. 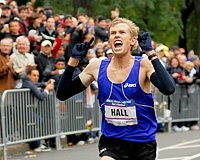 This Weekend: Ryan Hall Ready for US Cross Showdown With Ritzenhein Hall will skip World Cross to run London. Ryan Hall Mania in Australia: Ryan Hall's Dad Honed His Running Coaching Skills in Australia He lived there for 5 years and Ryan's older brother was born there. 20.93 for Wariner as his first race in the non Clyde Hart era is far from stellar. Up next is a 400. Flanagan: "I would say I'm a V02 hog" De Reuck: "I'm not really in the running scene anymore"
Flanagan and De Reuck are at opposite ends of their careers, but they provided a nice contrast on the teleconference. Flanagan set the US running scene on fire in early 2007 with her American record at 3k. She's hoping to add a little more strength to her regime so she doesn't fizzle out at the end of the season like in 2007. She went to Mexico for altitude training where the former NYC Marathon champ German Silva provider her with support. Flanagan sounded pleased with the results: "I would say I'm a V02 hog". Meanwhile, De Reuck is 43 and gave birth 7 months ago, but is hoping to make the US Olympic team in the marathon even though she doesn't even consider herself in the running world, "I'm not really in the running scene anymore... I don't know who is doing what or how everyone is training or racing. Maybe I'll go on the website and look who is entered"
More US Cross: Jody Hawkins: "When I was younger, in my 30s, I used to wonder why people did masters" If LetsRun becomes a master's website in 10 years we'll have thought the same thing. Dwain Chambers Reluctantly Selected To British World Indoor Team But Totally Snubbed At Same Time UK Athletics realized they had no legal right to keep him off the world indoor team so they put him on it, but they also then didn't invite him to one of the biggest indoor meets of the year - the Norwich Union Indoor Grand Prix in Birmingham this weekend. Beata Naigambo Runs 2:38:43 To Win South African Marathon Champs and Qualify For Olympics The runner up, Mamarolla Tjoka, ran 2:29:23 to qualify for the Games for Namibia. Executive Director of Boston Athletic Association Guy Morse Injured In Fall He's battling cancer as well. LA Times: Mo Greene: "I hope you all enjoyed the show I put on. I hope you enjoyed it as much as I enjoyed putting it on"
Sports Illustrated: John Smith on Mo: "Most guys would have quit. People look for a reason not to fight on, you know. " Washington Times "Most of all, he was a champion and a humanitarian who made watching the sport fun." Scientists May Finally Have an Explanation for Why Muscles Get Tired: Calcium Lactic acid apparently was tossed out as a reason a long time ago. Shows what we know. *Michigan Women Run National Leading 11:01 in DMR Wisco's Matt Withrow won the men's 5k in 14:11. 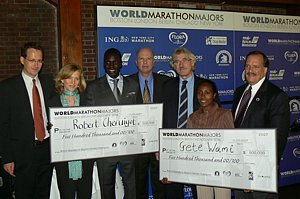 World Marathon Champion Luke Kibet Has Pull Out Pistol To Escape Death From Local Mob Last month he was beaten and spent three weeks in the hospital. Now this. Asafa Powell To Make 2008 Debut In Melbourne Next Thursday He had to cancel a scheduel appearnce in a 4 x 100 in Sydney as he fell in his home and has 4 stitches in his leg. *Victor Conte: "I truly believe that even the gold standard testing that they use at the Olympics is as easy as taking candy from a baby."